You’re looking for something yummy and a little different for your Memorial Day menu. You’re trying to eat lighter. You’re craving a burger. You’ve come to the right place! How about a Churkey Burger? It’s a delicious combination of ground turkey and chicken (no, it’s not redundant… really!) with moistness and flavor added to the mixture from pesto, onion, and crushed red pepper. Then, once it is grilled to perfection, top it with avocado, sliced tomato, onion, arugula, and your favorite cheese. Your craving is about to be satisfied! So why use both ground turkey and ground chicken? You could certainly use just one or the other – they’re pretty much equal in calories, fat, and protein. But while turkey has a nice flavor, it tends to be a bit dry. Chicken, it seems, has a little more moisture and it acts more like ground beef when mixed together with other ingredients for patties. 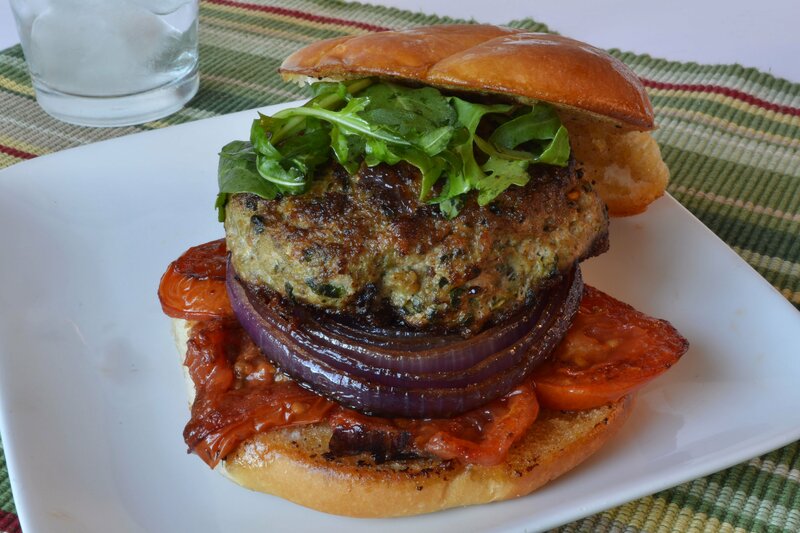 Add the pesto for even more moisture, and the Churkey Burger becomes a hearty and satisfying alternative to the usual burger fare. Now here’s a tip for a delicious condiment for your Churkey Burger: if you have some leftover pesto, let it drain through a sieve to get most of the olive oil out. Place the pesto in a bowl, add a little mayonnaise, and stir. It makes a wonderful slather on your bread and the perfect complement to the burger. Dive in and enjoy!